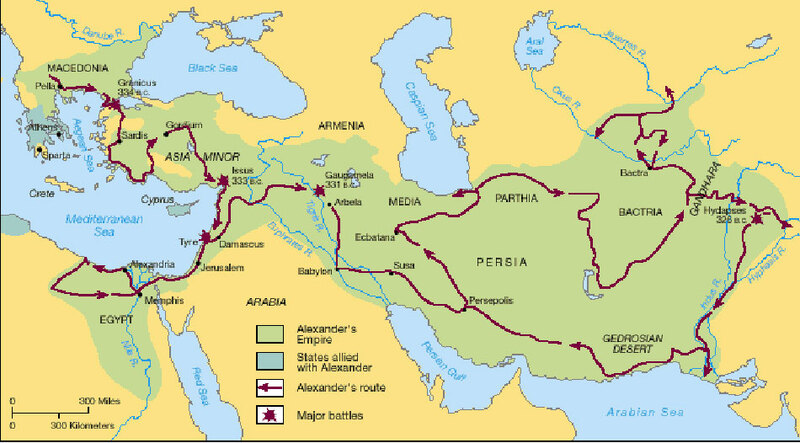 Alexander the Great followed major geographic markers to find his way around the known world. The most notable landmarks were the Indus River, the Tigris and Euphrates Rivers, the Nile River, the Amu Darya River, and the Mediterranean Sea (as seen in the map below). He did this because civilizations rise near water, and he and his men would need water on their journey. As Alexander’s army became less Macedonian and more Asian, he could have relied on his new recruits to point him in the right direction. They would know the surrounding areas much better than the invader did. The battles themselves also pushed Alexander the Great in different directions. The Persian commander Mazaeus pulled the Macedonian army northward to the east of the Tigris River. Alexander III crushed opposition by force. He and his men stayed in the city Persepolis during the winter of 330 BCE and pillaged the city, particularly the palaces, the following spring. When Spitamenes incited rebellion among the Sogdians and attacked the Macedonians using guerilla warfare, Alexander ordered mass deportations. Eventually Spitamenes was killed (approximately 328 BCE). Alexander also made political connections to win over supporters. He married Roxane, a Sogdian princess and arguably “the loveliest woman they had seen in Asia,” and hired Dahae, another Sogdian, to fight for him. When Darius was assassinated, possibly by Persian noblemen, Alexander sought to punish the murders. This would gain him support from the Persian aristocracy. Alexander also tried implementing traditions and beliefs from his Asian troops to win their respect. He had previously accepted Persian garments, which his Macedonian soldiers had allowed. The introduction of proskynesis, “the Persian court ritual,” however crossed the line. His European troops felt that that type of behavior should be reserved for worshipping the gods. Rome had met its match when Hannibal utilized war elephants in battle during the second Punic War. Being able to control and use these war beasts in battle gave Hannibal the upper-hand. Nonetheless, the extent of the elephants’ contributions to the Carthaginian army’s success is debated (Rhodan and Charles 363). The Romans were surprised when they caught word Hannibal and his army were crossing the Alps with intention to attack Italy. Publius Cornelius Scipio immediately sent troops over when he received the news of Hannibal’s plans (“Hannibal”). How did Hannibal get these elephants across the Alps and into Italy? What route did he end up taking? These questions are still highly debated amongst scholars. Polybius may have given a more accurate description of the path Hannibal took because, although he and Livy used the same first-person account, Polybius used the text written by a witness of the march, whereas Livy used a text that was a copy of the original witness’ text. Historians also claim that Polybius has greater knowledge of military circumstances than Livy. For these reasons, Polybius’ account is more favorable than Livy’s in this circumstance (“Hannibal in the Alps”). The Col du Montgenèvre route, traveling to Cesana Torinese & Oulx from Briançon & Montgenèvre, seems to be the most logical, historically accurate route Hannibal would have taken (see fig. 1). According to Livius.org, this route meets multiple criteria needed for it to be consistent with historical descriptions given by Polybius: The passage needs to be relatively high in the Alps because Hannibal’s men had to deal with snow; as the route nears Italy, it should head north; the distance should agree with historical sources; the route necessitates sufficient space to accommodate the passage and encampment of tens of thousands of soldiers and a little over three dozen elephants; and near the path, there had to have existed villages or tribes of people Hannibal could have conquered. The Col du Montgenèvre route is the only route that satisfies all these criteria, and the other routes fall short in comparison (Polybius 3: 50-55, “Hannibal in the Alps”). Figure 1. The possible routes Hannibal could have taken in the Alps are illustrated. The correct route proposed in this article is emphasized in gold (“Hannibal’s Crossing of the Alps”). There are some scholars (albeit a minority group) who are suspicious of whether or not Hannibal was actually able to bring elephants across one of the ten highest mountain ranges on Earth. But there is ample evidence to support the possibility. Chief among that evidence are the records of the British Alpine Hannibal Expedition under the leadership of British engineer John Hoyte (see fig. 2). In 1959, Hoyte conducted an experimental archaeological expedition wherein he successfully guided an Asian elephant named Jumbo, on loan from a zoo in Turin, from France across the Col du Mont Cenis to Susa, Italy, effectively putting to rest the arguments that Hannibal’s crossing was no more than legend (“The British Alpine”). However, Jumbo was most likely not the species of elephant that Hannibal yoked into his trans-Alpine war machine. Extant sources and archaeological evidence suggest that a now-extinct species of African forest elephant would have been the most probable species. While some scholars speculate that Hannibal’s elephants were of the Syrian or Indian variety, this may have been in part due to being “…supposed, mostly from a reference to an elephant named Surus (“the Syrian”) in a fragment of Cato the Elder’s Annales … that one of Hannibal’s elephants may have been Indian” (Charles, “African Forest” 342). The majority of war elephants, however, were undoubtedly African forest elephants. One of the key pieces of archaeological evidence supporting this claim is cited by Sir William Gowers: “…an admirable representation of an African elephant on a silver coin (date about 220 B.C.) of the Barcid dynasty in Spain—it may have been done from one of the actual elephants which afterwards crossed the Alps. The rider does not look and is not dressed like an Indian” (43). The extant texts support this claim, as well: “…Silius Italicus, writing under the emperor Domitian, seems to be quite aware the beasts were of African origin—witness the phrase “Libyan beasts…” (Charles, “African Forest” 345). Charles goes on to state that “By the time of the First Punic War, the African forest elephant formed an important part of Carthage’s military arsenal” (“African Forest” 339). But what could it possibly matter which species of elephant Hannibal brought across the mountains? It’s simple: Larger animals require more food, and “…the adult forest elephant generally averages only around half the weight of the two larger varieties [i.e., Indian and savannah African]” (339). That forest elephants were more available in greater numbers to the Carthaginians was logistically fortuitous; if they had employed a larger species, the baggage train would’ve needed to cart twice as much food on a journey that already bordered on the impossible. The smaller breed was essential in executing the crossing. Accounts of the other myriad obstacles Hannibal’s armies faced appears in the work of the historian Polybius, who notes that there was some difficulty at passing through a particular mountain pass. He wrote that “in three days [Hannibal] managed to get the elephants across but in a wretched condition from hunger” (135). Hannibal might have gotten them over the mountains, but how did he manage it? There are a few factors that probably contributed to the elephants’ cooperation: their extensive training, the food provided by the army, and the presence of their trainers. The elephants that crossed the Alps probably had been exposed to extensive training that took place prior to the campaign. In two of his published books, John M. Kistler describes the use of elephants in warfare. He writes that training is a long process because most elephants are generally too nervous for warfare, and painstaking training is required to prepare them for combat (War Elephants 9). Based upon the startled way the elephants reacted to the prospect of crossing the river Rhone, shown in the picture below, Kistler speculates that Hannibal’s elephants had not had any previous experiences and had likely been reared by Hannibal since they were juveniles (War Elephants 111). If this was indeed the case, Hannibal would then likely have had a long period of extensive training invested in these particular elephants. In addition to an extensive training period, the species of the elephants in question might have contributed to their cooperation. In an article published in The Classical World, Michael B. Charles and Peter Rhodan describe how a new extinct species of African elephant, the African forest elephant (Loxodonta cyclotis) was the one trained by the ancients for warfare (364-365). There is some dispute that Hannibal employed some Indian elephants, but Charles and Rhodan attribute the description of Indian to be more reflective of the type of elephant riders, the eastern mahouts (365-366). There are two potential approaches that could have been taken to the elephants’ training. In the most extreme case, the training might have involved what to a modern mind would constitute animal cruelty. It is possible that abusive methods, such as those previously used by circuses to train elephants, were used by the ancients. The Humane Society writes that these circus training methods involve beating and starving the elephants in order to achieve human dominance over them. If this is indeed the case, it would be unlikely that the starvation resulting from the trek across the Alps was anything ‘new’ to the elephants. This idea might sound contradictory to the very idea of a war elephant. How could such supposedly nervous and broken-down animals then become such destructive forces on the battlefield? Certain techniques were known to be used to rile the elephants into action. A BBC documentary entitled Hannibal: The Man, The Myth, The Mystery briefly focuses specifically on the employment of elephants on the battlefield. The documentary discusses how the elephants would be plied with alcohol and deliberately prodded and poked in their ankles until they became angry, at which point they would be pointed at the enemy.This approach seems counterproductive during a march, but such methods might not have been necessary. Kistler notes that most were “only used for carrying supplies in an auxiliary role” implying that training an elephant for transportation was easier than training an elephant for warfare (9). However, this abuse is an extreme version of the training that might have been used on Hannibal’s elephants. There is another approach that Kistler seems to favor. Kistler compares the ‘tamed’ elephant to being something akin to a human employee, writing that “in exchange for special foods and good scrubbing baths in the river, the elephant will do some work for the humans” (War Elephants 5-6). In this case, the incentive for the elephants to cross the Alps might have less the result of abuse but rather a desire for food. Kistler writes that an elephant would need more than 200-300 pounds of food daily, along with a decent ration of water (War Elephants 11). Due to the sheer amount of what these beasts ate, Kistler suggests that the trainers (the mahouts) would often allow them to go foraging for their own food away from camp, training the elephant to return to the camp “for treats and work” (Animals in the Military 58). This more lenient approach to training might have played a role in convincing the elephants to cooperate with Hannibal’s crossing of the Alps. Foraging for food would have proven difficult in the alpine terrain of the Alps. The trained elephants might have fallen back on the trained ‘employee and employer’ relationship described by Kistler. They would likely have been given the order samyana (to march) and carried out with the expectation of receiving food as a reward. Speculation of the nature of training and incentives aside, it is likely that the animals were trained in some way and to the presence of their trainers might have cemented their cooperation. A History Herald article by Yozan Mosig titled “Hannibal’s Elephants: Myth and Reality” describes how the mahouts might have used commands or applied pressure to control the elephants’ movements. Kistler agrees with that method and describes how a mahout would use a hook called an ankhus “to guide the elephant when voice and foot commands were not enough” (Animals in the Military 60). Kistler asserts that the hook could be used in combat when the noises of the battlefield drowned out the mahout’s voice (23). However, it is not hard to see how someone could use it to implement more abusive methods. Such techniques are best demonstrated in a particular scene when Hannibal tried to cross the river Rhone, prior to reaching the Alps. Kistler refers to the historian Livy’s description of how “one mahout was beating his ’ferocious’ elephant” in an effort to try and persuade her to cross the river (War Elephants 113). She ultimately turned on him and attacked him (War Elephants 113). Kistler believes this scene has an element of truth to it, but he disregards the idea that the entire herd was beaten in order to persuade them to cross (War Elephants 113). He states that it would have been too dangerous a strategy considering it risked losing control of the elephant herd (War Elephants 113). In any case, this scene is a good representation of the constant reinforcement the elephants would have likely endured at the hands of their mahouts during their crossing of the Alps. There is only one problem with the idea of the mahouts exerting influence over the elephants. Polybius writes that many of the mahouts were drowned during the crossing of the river Rhone (War Elephants111). Kistler states that other mahouts and mahout trainees were likely paired up with the elephants (War Elephants 114). After all, is doubtful that Hannibal would have let the elephants go rider-less. While these trainers probably played a similar role, it is doubtful that their efforts would have been effective as the original mahouts. However, despite this limitation, the trainers had another technique that might have been used. In addition to the domineering physical presence of a rider, Hannibal’s army likely had a failsafe mechanism to employ in the event of losing control of the elephants. It is mentioned by Charles and Rhodan in their shared article that each mahout carried a hammer and a chisel to drill into the elephant’s skull if the beast ever went out of control (371). It is possible that some of the elephants would have faced this consequence if they proved uncooperative and problematic. Charles and Rhodan write that “according to Livy, [it] was an innovation on Hasdrubal’s part” (371). Considering Hasdrubal was Hannibal’s uncle, it is likely he was familiar with this technique. Essentially, the elephants had little choice in the matter. BBC Explore. “Amazing! Hannibal’s Elephants of War.” YouTube. Youtube, 13 May 2009. Web. https://www.youtube.com/watch?v=nuVb51MGERY. Accessed 01 Oct. 2016. Charles, Michael B., and Peter Rhodan. “Magister Elephantorvm: A Reappraisal of Hannibal’s Use of Elephants.” The Classical World 100.4 (2007): 363-89. Web. Charles, Michael. “African Forest Elephants and Turrets in the Ancient World.” Phoenix 62.3 (2008): 338-362. Print. Gowers, William. “The African Elephant in Warfare.” African Affairs 46.182 (1947): 42-49. Print. “Hannibal.” Wikipedia: The Free Encyclopedia. Wikimedia Foundation, Inc. 28 Sep. 2016. Web. https://en.wikipedia.org/wiki/Hannibal#Overland_journey_to_Italy. Accessed: 29 Sep. 2016. “Hannibal’s Crossing of the Alps.” Wikipedia: The Free Encyclopedia. Wikimedia Foundation, Inc. 26 June 2016. Image from web. https://en.wikipedia.org/wiki/Hannibal%27s_crossing_of_the_Alps#/media/File:Hannibal_way_thru_Alps.jpg. Accessed: 29. Sep. 2016. “Hannibal in the Alps.” Livius.org. 6 April 2016. Web. http://www.livius.org/articles/person/hannibal-3-barca/hannibal-in-the-alps/. Accessed: 29 Sep. 2016. Henri Motte. Hannibal Barca Crossing the Rhone. 1878. Wikipedia: The Free Encyclopedia. Wikimedia Foundation, Inc. 26 June 2016. Image from web. https://en.wikipedia.org/wiki/Hannibal%27s_crossing_of_the_Alps#/media/File:Hannibal_traverse_le_Rh%C3%B4ne_Henri_Motte_1878.jpg. Accessed: 03 Oct. 2016. Kistler, John. “Elephants.” Animals in the Military: From Hannibal’s Elephants to the Dolphins of the U.S. Navy, ABC-CLIO, 2011, pp. 55-96. Print. Kistler, John. War Elephants. University of Nebraska Press, 2007, pp. xiii-118. Print. Mosig, Yozan. “Hannibal’s Elephants: Myth and Reality.” The History Herald, 18 May 2013. International Shaw Society, Inc. Web. http://www.thehistoryherald.com/Articles/Ancient-History-Civilisation/Hannibal-and-the-Punic-Wars/hannibal-s-elephants-myth-and-reality. Accessed on 01 Oct. 2016. Polybius. “Book III.” The Histories. Translated by William Roger Paton, vol. 3, Leob Classical Library, 24 Jun. 2015. Web. http://penelope.uchicago.edu/Thayer/E/Roman/Texts/Polybius/3*.html. Accessed 30 Sept. 2016. “The British Alpine Hannibal Expedition.” Johnhoyte.com. John Hoyte. n.d. Web. 5 Oct. 2016. The Humane Society of the United States. “Circus Myths: The True Cruelty under the Big Top.” Web. http://www.humanesociety.org/issues/circuses_entertainment/facts/circus_myths.html. Accessed 01 Oct. 2016. Despite the fact that it is not the prevailing opinion among historians, we believe that Hannibal took the Col de Traversette pass through the Alps. Col de Traversette is a shorter path than most of the options. While there is a longer march after they exit the pass, strategically a longer march on good terrain is better than a longer march over difficult travel in snowy and icy conditions. In addition, it is advantageous to take the post-Alps rest further from the battle site, so as not to be intercepted and attacked with a tired army. Any route through the Alps has problems with grazing grounds for animals. 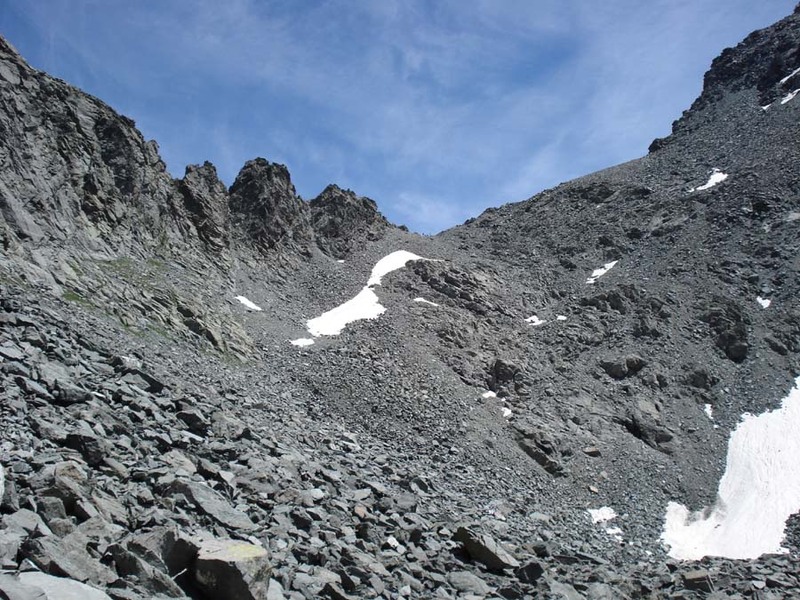 Paths from the summit are devoid of vegetation, and Livy states that “Four days were spent over the rock, and the animals were almost starved to death, for the heights are mostly bare of vegetation.” Taking a longer route, such as Col du Montgenevre, surely would have spelled death for their animals. Recently, scientists have discovered a massive dump of mammal feces in this pass. The type of microbes found there fit the particular horses of the era, and date back to precisely the time of the Second Punic War. How did Hannibal get the elephants over the Alps? In short, we believe that it was simply due to training. Elephant riders in Alexander’s army trained single animals for years and years, and in addition to their experience with their elephants had particular techniques and tools with which to get it to go where they wanted. Two other ways to move the elephants are (1) leading them by ropes and such and enticing with food, or (2) getting them drunk, as some sources suggest. The latter is unlikely, since it presents several dangers commonly associated with drunkenness in any being. Larzo, Enrico de. “Scientists Find Hannibal’s Route Through Alps.” http://www.sci-news.com/archaeology/hannibals-route-alps-03763.html. Accessed 9/30/16. Lendering, Jona. “Hannibal in the Alps.” http://www.livius.org/articles/person/hannibal-3-barca/hannibal-in-the-alps/?. Accessed 9/30/16. Cartwright, Mark. “Elephants in Greek & Roman Warfare,” Ancient History Encyclopedia. Last modified March 16, 2016. http://www.ancient.eu /article/876/. Accessed October 4, 2016. We believe that Hannibal crossed the Alps by passing over the Col de la Traversette. It may have been one of the highest passes and one of the most difficult ones to cross but for that reason we think he crossed there. The 3 reasons as to why we belive he crossed through this pass is that it is one of the highest so that it is the most likely to have snow on it year round, it has a steep difficult decent on the Italian side, and Polybios said that Hannibal marched toward the highest passes of the alps. The second reason that we believe that Hannibal crossed here is that Poybios mentioned that it was very difficult to descend. (Brown) The Col de la Traversette has a very steep descent on the Italian side so it would fit the description. The third reason is that Polybios also said that Hannibal marched toward the “highest passes in the Alps”. (Brown) In the section of the Alps where Hannibal could have crossed the Col de la Traversette is one of the highest passes. Now that we have decided on which pass they took, the question is how did they get all their elephants over that pass? We believe that the 3 most plausible ways that Hannibal got his elephants over the Alps are that he either trained all the elephants from a young age to obey him, or he tamed the lead elephant to obey him and all the other elephants followed, or he continually fought with the elephants to keep climbing by beating and whipping them. Deekeswar, Harshavardhan. Quora How to Train a War Elephant. 15 September 2014. Web Page. 4 October 2016. Lendering, Jona. Hannibal in the Alps. 6 April 2016. Web Page. 4 October 2016. Brown, J. E. T. “Hannibal’s Route across the Alps.” Greece & Rome 10.1 (1963): 38-46. Web. Col du Montgenevre, between Briancon in France and Susa in Italy, is the only pass in this area which would fit the description of all 5 key points. Finally, while it can’t be said which account of later witnesses is 100% accurate, it can be said that Polybius of Megalopis was likely have the most accurate information because he interviewed various men who were actually present during these occasion. He also personally explored the country, and he’d crossed the Alps himself to discover the most feasible route. (Livius, 2016). There are several possible ways that Hannibal got his war elephants over the Alps. According to Charles & Rhodan (2007), Syrian elephants were most likely used by Hannibal and his army. This is because Syrian elephants were inferior in size to African elephants and much easier to train. Training and taming the elephants would have made it easier to bring them over the Alps. Although there is some speculation on the use of African elephants from the coin found, we know for sure that Hannibal himself had at least one Syrian elephant. It may be thought that his train of elephants were both African and Syrian. When elephants are tamed, they are tied so they cannot wander and beaten. This goes on without food or water for days, until the elephant is finally submissive. Then, food and water are given, and the elephant spends time tied to already tamed elephants until its trainers are satisfied it can work without the other elephants (Frei, n.d.). Because of this process, tamed elephants become reliant on their handlers for subsistence. Basically, if the animals didn’t cross and climb the Alps, they wouldn’t eat or survive. Elephants follow herd instincts. Therefore, in some accounts of Hannibal, the female elephants were able to lead the rest of the herd into undesirable terrain (O’Bryhim, 1991). Another way that Hannibal could have provided a way for the elephants to cross the Alps was by going ahead of the elephants and clearing a track for them to travel on more easily. At one point on the journey, Polybius wrote about how at one point in Hannibal’s journey, it took three extra days work to make the track fit for the elephants to cross (Brown, 1963). Charles, M. & Rhodan, P. (2207).Magister Elephantorvm: A reappraisal of Hannibal’s use of elephants. The Classical World, 100, 4.